Comprehensive 3D gross anatomy of male and female includes microanatomy of senses and tissue types, 3D moving models of muscles and bones. 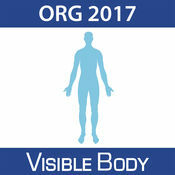 Provides access to definitions, pronunciations, and disease descriptions and permits users to create views into human body including rotating and zooming images. 2017 edition. Download the app, then connect to GW via GWireless (on-campus) or Cisco AnyConnect (off-campus). The app will check that your device is at an institution with a valid subscription. To maintain off-campus access, open your Visible Body app on-campus or off-campus while connected via Cisco AnyConnect at least every 150 days.